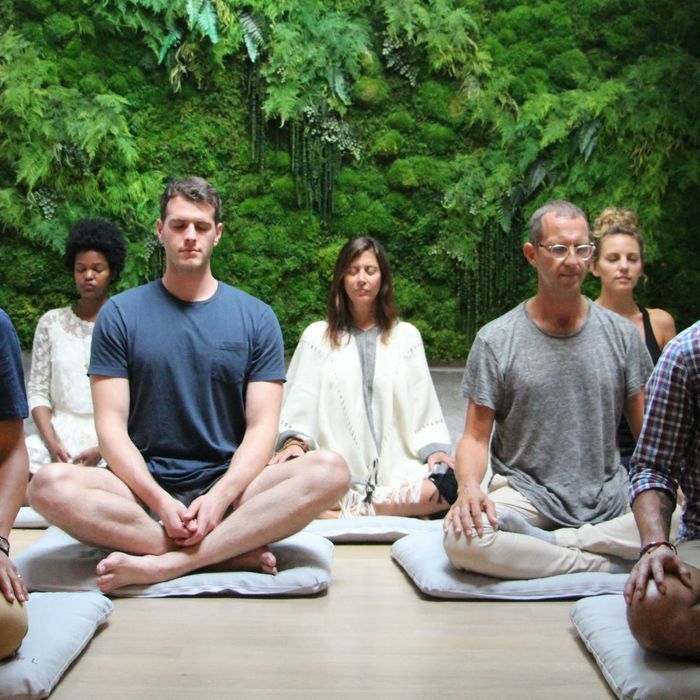 New York City is filled both with stressed-out people and, luckily, a wide array of places to learn how to quiet your mind. In recent years, a small wave of modern millennial-minded meditation venues has arrived to join more established centers with their roots in the hippie days of yesteryear. Among the new and old, here are the absolute best options for beginning meditators looking to become more grounded. In just 18 months since it first opened, MNDFL has become the city’s best access point for beginners interested in learning to meditate. The operation now has two locations in Manhattan and one in Brooklyn, offering 150 classes a week from 35 teachers. Like many successful start-ups, MNDFL has removed vowels from its name while optimizing user experience. You can reserve a class spot online — just like at SoulCycle — and sessions are as short as 30 minutes, compared to what can be a two-hour commitment for beginners at other centers. MNDFL’s three locations are calming and bright, appointed in neutral grays punctuated by blond woodwork and the vibrant green of healthy houseplants and vertical gardens. Classes come in 12 categories, emphasizing things like breath, mantra, emotions, or intention. Like a yoga studio, you can choose by style of practice or by teacher. MNDFL is more expensive than other city options for learning meditation: 30-minute classes are $18, or less, if you buy a multi-class pass. But you can get an intro month of unlimited classes for $75, and MNDFL offers a number of weekly “community classes” for $10. The Shambhala Meditation Center, founded in 1971, is one of the oldest meditation centers in New York City. It’s devoted to the teachings of Chogyam Trungpa, a Tibetan teacher who had a huge impact on the development of Buddhism in the United States. The sixth-floor center is a bright and colorful place with several airy meditation halls. You can join weekly hour-long beginner sessions on Wednesday evenings and Sunday afternoons for $10, and there are weekly by-donation public sittings three times a week. The center also hosts a wide variety of weekend workshops and has an array of community groups to join, including for people who are LGBTQI, in recovery, under 40, or dealing with PTSD. New York City has no shortage of Tibetan-style Buddhist centers, but Kadampa Meditation Center, nearly 25 years old, is one of the more popular ones. Kadampa’s ground-floor space makes it one of the most visible of the half-dozen meditation centers that make up Manhattan’s “Dharma District,” just west of Madison Square Park and the Flatiron Building. There’s a welcoming lobby with a book store and one of the most striking meditation halls in the city, complete with a huge golden Buddha statue seated behind glass, alongside statues of venerable gurus. The center offers drop-in classes for beginners, including popular evening lectures as well as lunchtime and after-work sittings. Classes are $15 for 90 minutes or you can become a member for $85 per month and take all the classes you want. The newest offering among the city’s meditation-2.0-style centers is Inscape. Founded by the former CEO of boutique women’s fashion retailer Intermix, Inscape offers a multi-platform experience: Classes at the meditation studio on West 21st Street are complemented by the official Inscape app for your smartphone. The centerpiece of the physical experience is an egg-shaped room known as the Dome, a yurt-like structure with colorful crepuscular lighting, Furnished with meditation cushions and graceful wooden benching, you might feel like you’re joining a secret meeting of the Jedi council. Meditation classes at Inscape come in several flavors — mindfulness, mantra, focus, and visualization — but they all feature prerecorded audio guidance, provided by a woman with a hard-to-place accent. Sessions range from 22 to 88 minutes for $18 to $29. Another center with deep roots, New York Insight is hidden on the seventh and tenth floors of a building on 27th Street, occupying a homey loft-like space. The center is an offshoot of the Insight Meditation Society in Massachusetts, which was started by three Americans who brought the teachings of Southeast Asia’s Theravada Buddhism to the United States in the 1960s and ‘70s. Insight meditation, also known as Vipassana, is a very accessible, no-frills mindfulness technique — not quite as austere or formal as Zen can be and not as colorful or baroque as Tibetan Buddhism. The center offers a by-donation beginner’s orientation every Tuesday night and a variety of courses on Mindfulness-Based Stress Reduction and how to apply Buddhist principles to everyday life. The Path is so outside-the-box that it doesn’t even have a physical location. It draws young people every Tuesday to various locations that change seasonally; currently it’s a borrowed top-floor room at the Standard hotel in the East Village featuring a panoramic view of the city below. The Path was created by Dina Kaplan, the former co-founder and COO of Blip, after her high-profile success brought her to the verge of a nervous breakdown. That led to a two-and-a-half-year-long trip around the world and the realization that she wanted to make meditation fun and easy for all. She’s recruited instructors from a variety of meditation traditions, who are encouraged to focus on four themes: energizing, mindfulness, mantra, and compassion. You can book a cushion at one of the weekly sessions for $25.68, and meditate in a room lit with tea lights as the sun sets over the city below.